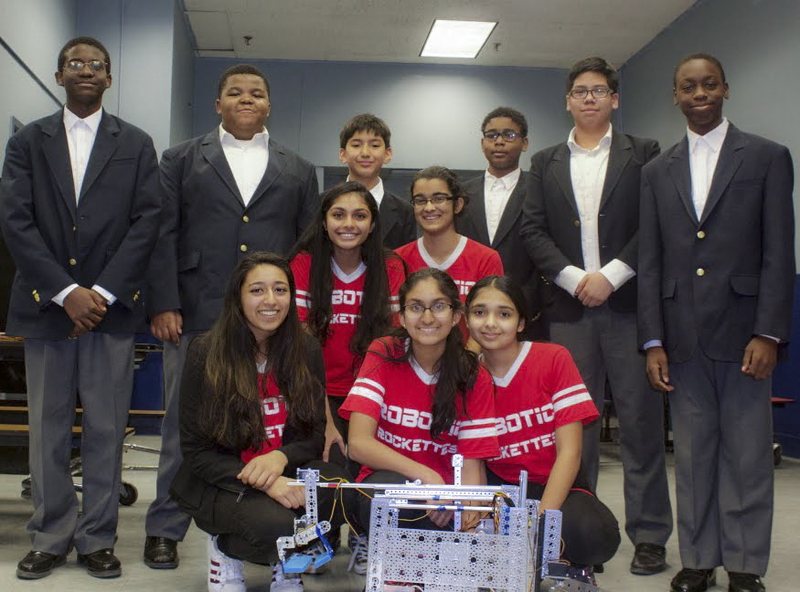 Recently members of the YWCA Plainsboro Robotic Rockettes visited the STEM classes at NBCS and shared with our students their work with robots. The Rockettes meet regularly to improve as a team, share their work with other groups and prepare for the First Tech Challenge. The Challenge is a robotic competition that allows students in grades 7-12 to compete in local, state, regional and national levels. The challenge is to construct a robot that will perform a prescribed task in timed trials. Sounds easy, but with lots of moving parts, remote controls and a strict time deadline the operations can prove a real challenge! Our students are in the third year of a developing STEM program as part of the school’s science curriculum. They are interested in the First Tech Challenge and should be ready by next year to enter the local competition. By the end of the visit each NBCS STEM team had constructed a functioning robot under the direction and guidance of members of the Robotic Rockettes. “We look forward to competing against them in the future,” stated Chris Reyes, an NBCS STEM leader.